Back in SOS July 2003 (www.soundonsound.com/sos/jul03/articles/echoindigo.asp) we reviewed Echo's Indigo, an extremely compact PCMCIA peripheral that offered 24-bit/96kHz audio support via a pair of 3.5mm headphone sockets. Once the card had been inserted into its Type II Cardbus slot, the only part that remained visible was a grey plastic pod just two inches high by one inch wide, and half an inch thick, with 3.5mm sockets at either end, and a tiny thumb-wheel output level control and blue LED activity indicator on the top. As footprints go, the Indigo is about as small as most people's big toes, and has proved to be extremely popular with musicians who want an easy but high-quality way to monitor audio on their laptops. Given this success, it's not surprising that Echo have now catered for those of us who want to record on our laptops as well, and for those who want more versatile output options. The Indigo IO under review here has one stereo line input and one stereo headphone/line output instead of the twin headphone outputs of the original Indigo, with an identical thumb-wheel output level control, while the Indigo DJ provides two discrete stereo outputs — outputs 1/2 for phone/line use controlled by the thumb-wheel, and 3/4 at line level unaffected by the thumb-wheel. Both products also include a six-foot-long audio connection cable, which wasn't shipped with the original Indigo, with a stereo 3.5mm jack at one end and twin RCA/phono plugs plus quarter-inch jack adaptors at the other. A-D & D-A converters: 128x oversampling. Line input: unbalanced 3.5mm jack at -10dBV sensitivity, with 10kΩ impedance. Line output: unbalanced 3.5mm jack at -10dBV nominal level and +6.3dBu maximum output level. Sample rates: 32, 44.1, 48, 88.2 and 96 kHz. Driver formats: WDM-MME, GSIF, ASIO 2.0. Frequency response: 10Hz to 20kHz, ±0.5dB. THD+Noise: <0.0014 percent A-weighted, using 1kHz sine wave at -3dBFS. 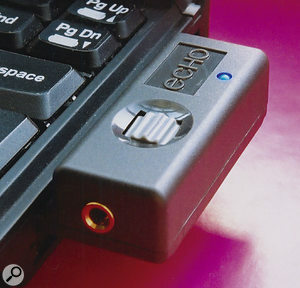 The original Indigo suffered by not having fully multi-client drivers, but now Echo have adopted exactly the same solution as on their Mia and Mia MIDI PCI soundcards — creating eight virtual outputs that are internally mixed down to the single physical stereo output that emerges from the socket. Each virtual stereo pair can be allocated to a different software application, so for instance you could simultaneously use outputs 1/2 with Cubase ASIO drivers, 3/4 with Wavelab, again with ASIO (or WDM-MME for that matter), 5/6 with a stand-alone soft synth that isn't VSTi- or DXi-compatible, and 7/8 with Gigastudio using the GSIF drivers. These new drivers work with all three Indigo models, and a dummy input device is provided for the Indigo and Indigo DJ to suit some audio applications that expect to see identical numbers of inputs and outputs. The Indigo IO under review has a hardware input and therefore doesn't need this fix. 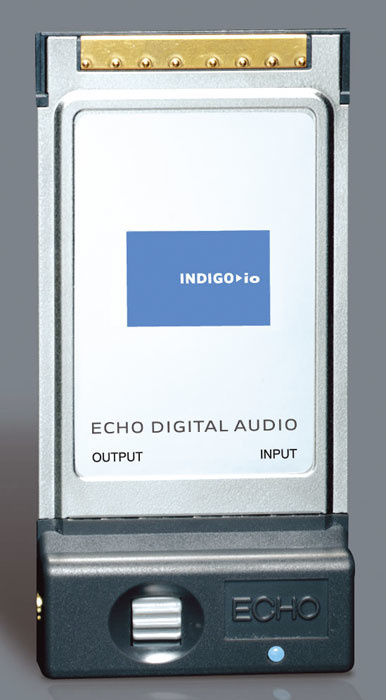 To complement the new virtual outputs, Echo now include their familiar Console utility with the Indigo range. 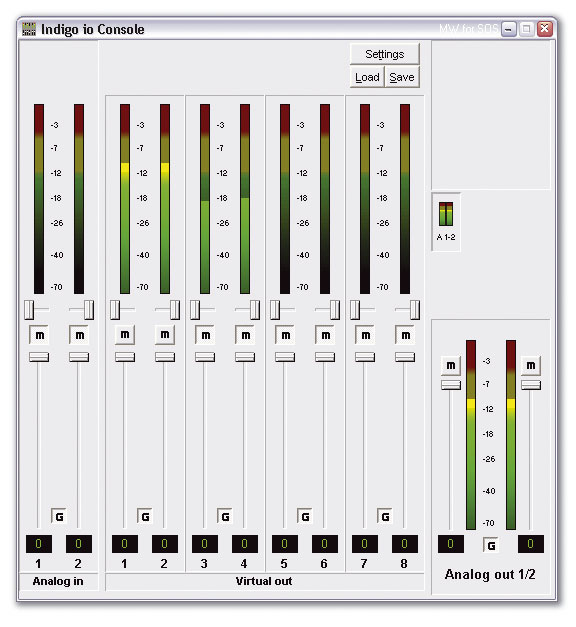 This provides comprehensive metering, mixing, and monitoring functions.I installed the latest version 6.10 drivers running under Windows XP on my new 1.4GHz Millennium Centrino laptop — the reason for the high driver version number is that Echo use the same core code for their other soundcards. These drivers will run on Windows Me, 2000 or XP, while Mac owners are catered for by the version 1.3 drivers for Mac OS 10.2 (Jaguar). To control the internal mixing of the virtual outputs, Echo supply their familiar Console 3 'virtual control surface' (the '3' denoting its third-generation status), which has peak-reading meter displays for each virtual output device, software faders to mix them together, mute buttons, and stereo gang buttons to lock channel pairs together. There's an identical set of controls for the overall analogue output of all three Indigo models, while the new DJ model has an additional buss select 'A 1-2' or 'A 3-4' option, so you can create a separate mix of all eight outputs to be sent to each discrete physical output, and the IO model has an extra pair of channels for the analogue input. The same versatile zero-latency monitoring options are available as for the entire Echo range, and for PC owners there's an additional page where you can set the GSIF buffer size if using Gigastudio. The specs of the three Indigo versions are slightly different, but all contain identical 128x oversampling converters and a 24-bit Motorola DSP for mixing and monitoring. Although it's possible to measure a card's audio performance without a loop-back cable, the additional input does make this rather easier, and I was able to run Rightmark's Audio Analyser to determine just how good the Indigo IO was. It exceeded its stated frequency response, measuring -0.5dB at 7Hz and 20kHz, whatever the sample rate, with a low THD of 0.0011 percent and stereo crosstalk of just -101dB; and on my laptop it managed a 103dBA dynamic range — not quite as good as the quoted 109dBA-plus, but still perfectly respectable. Subjective audio quality was also excellent, being a far cry from any laptop's motherboard sound chip, and the ASIO drivers performed right down to their lowest 3ms latency setting with no sign of audio glitching. The GSIF drivers also worked very well, providing Gigastudio with latencies down to 64 samples, and a resulting latency of between 3 and 6 ms.
One of the great advantages of the Indigo's design is that it takes up very little additional space when plugged in. As well as being a headphone output device, the original Indigo could also function as a high-quality line output for connection to external audio gear, just as the two new models do. Of the cons in our original review, the new multi-client virtual output drivers resolve the first, and the continued absence of Windows 9x or Mac OS 9 drivers is becoming increasingly unimportant as Windows XP and OS X are more widely used. Moreover, for a laptop sound peripheral, the beauty of the eight virtual outputs is that you can run multiple applications like Cubase SX and Gigastudio without requiring multiple physical outputs and an external mixer, both of which would compromise the Indigo's tiny footprint. Compared with the original Indigo, the added input of the Indigo IO makes it far more versatile for most studio or mobile musicians, while the twin outputs of the Indigo DJ will appeal more to those who want to add external hardware effects to different sounds, or to the DJ who wants to control twin virtual 'decks'. Doubling the facilities whilst increasing the price by just £79 to £179 represents excellent value for money in my book. For my purposes, the Indigo IO proved the perfect companion for my new Centrino laptop, so I bought the review model. Millennium Centrino laptop with Pentium-M 1.4GHz CPU, Intel 855PM 'Odem' chip set, 512MB PC266 SO-DIMM RAM, running Windows XP with Service Pack 1. Tested with Steinberg Cubase SX 2.0.0 and Wavelab 4.01a, NI Pro 53. Eight virtual outputs, just like Echo's Mia and Mia MIDI. The same tiny footprint as the original Indigo model. Still no support for Windows 9x or Mac OS 9. Echo's original Indigo was a clever design for those who want to keep their laptop as portable as possible, and the new drivers and output options of the IO and DJ versions will make them appeal to even more musicians. Arbiter Music Technology +44 (0)20 8970 1909.